Did Open Borders Change the Course of World History? Allow me to make the following counterfactual: Suppose all immigration of Germans to America had been blocked from the start. Restrictionists would have had lots of arguments on their side: Germany was a hotbed of various collectivist ideologies that were inimical to American liberty: rabid Nationalism, Antisemitism, Communism, and National Socialism. IQ of German Americans is at best average. German immigrants only slowly assimilated and kept speaking German. And then alien habits like minors can drink beer. Etc. Now let’s go back to 1940. The US had a population of 132 million, Germany including Austria, Greater Germany, had a population of 79 million. So the US had a population 67% larger than that of Greater Germany. Today about 17% of Americans claim German ancestry. Since there was only low immigration of Germans after World War II compared to other groups, the fraction should have been even higher in 1940. Assuming a quarter of US population in 1940 was of German descent, US population in the counterfactual would go down by 33 million to 99 million. Add the 33 million to the German population and you get 112 million. So now Greater Germany is 12% more populous than the US. The effect would have been like another major power of 66 million had entered the war on the side of the Axis. And it gets worse: Forget about General Eisenhower, and get used to Generalfeldmarschall Eisenhauer. Same for Chester Nimitz for the Navy (now: Generaladmiral Nimitz) and Carl Andrew Spaatz for the Air Force (now: Generalfeldmarschall Karl Andreas Spatz). And more as a footnote: also no William Patrick Hitler receiving a Purple Heart for his service in the US Navy. I will not expand on the counterfactual and make a claim that the Axis powers would have won the war. But then I am not sure I could argue the opposite. In a world of completely closed borders for citizens of Germany, Italy, and Japan, you would have to repatriate also millions of German emigrants and their descendents from the British Empire and another big chunk of the US population for Italian Americans. How well did restrictionist predictions stand up in the real world? Letting a fifth column onto your soil could have disastrous consequences. Plenty of danger for the US, right? Moral: You can look on immigrants as people who perhaps keep some allegiance to their old country and its culture. If that culture is thorougly collectivist as it was in Germany in 1940, that does not look good. Assimilation may be slow and incomplete. However, that is looking on things only from the limited perspective of one country. If you look on them at a global scale, the effect is different. Even incomplete assimilation means having more people who are less committed to their previous views, and even some (and in the case of German Americans many) who are completely out of reach for collectivism. Open borders undermines collectivism. So if you are concerned about liberty in the world long-term, you would want to have as many people as possible who are not stuck in collectivist societies and can be indoctrinated by totalitarian governments, and as many as possible who are exposed to liberty and have a chance to change their minds in an open society. Good luck for the world that liberty went along with open borders for a long time. 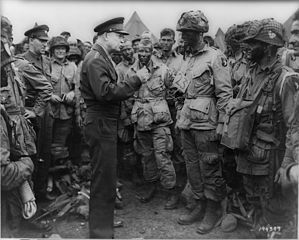 The photograph of then-General Dwight D. Eisenhower speaking with paratroopers on the eve of D-Day, 1944 featured in the header is available at the Library of Congress. Did Open Borders Change the Course of World History? is licensed by Hansjörg Walther under a Creative Commons Attribution 3.0 Unported License.